According to the Mayans we have 4 years left. Happy New Year! Sorry for the header — the history channel’s negativity astounds me. Anyway, Just a little shoutout. I’ll be hanging with family because, as my brother Drew put it, “I’m not driving around on amateur night.” Brilliant. Here’s a follow up to my Narnia Christmas post from Lord Somber. This is why I dig the Somber one — he gently checks me, unapologetically, and I generally learn something from it. People who expect you to grow are a good thing. This is a good article, all about how the “mainstream” (I don’t even know what this means anymore…) media, for all their promotion of diversity of opinion — and their willingness to lynch those they see as not sophisticated enough to do the same — is remarkably closed-minded when it comes to deviations from their version of diversity. I know, it’s a contradiction. Try explaining that though and you risk concerted efforts to besmirch your good name. Never argue with small-minded people of any stripe. Just tell them they are entitled to their opinion — I think I’m going to read “Crimes Against Logic” — smile and walk away. For the record, I recognized the similarities between the Narnia stories and the Scriptural stories but didn’t even know what an apologist was until I was in High School. That’s what I mean about not understanding the allegory — allegories are literary constructs and I just hadn’t learned what those were when I was 8 or 9. Keep me in line Somber. Happy New Year people. Be safe. Dear Lord God of everything that is pure and delicious in this world, thank you for the small blessing of a week off from work. I will fill it by looking for work. Ironic, no? Also, thanks for powdered sugar covered date-nut treats (thanks T) and for people willing to pray for my success in both procuring new employment and quitting the devil tobacco. I promise in the coming year to live more within the individual moments of life and will try not to ruin things by worrying about them. Also, keep the loved ones near and afar from danger and financial instability. And help me figure out how to make it all flow with laughter and self-awareness and to open my mind a little more so I can see that frustrating situations are generally the ones with the most potential for growth. I’m out and amen. Stella and I are going for a walk around the block. The Wagon — Dinosaur Jr.
UPDATE: Oh yeah, oh yeah — This movie’s awesome. See it. Just because they’re awesome. Savor the love. Funny story: When I got home last night in the wee hours of the morning, my hands and arms — particularly the left set — were killing me. Like arthritis achy. I started freaking myself out thinking I was maybe having a heart attack — yes, I know but my brain is a very powerful manipulator — until I remembered that I had been holding, carrying and generally wrestling with babies/kids all day and my forearm muscles and hands are just unaccustomed to that. I have a new respect for moms. When I was a kid I read all of CS Lewis’ Chronicles of Narnia. A couple of times in fact. I loved them and was blissfully unaware they were Christian allegory until much, much later. When I discovered the metaphor I put them away for awhile because I put all of the rules of my upbringing away for a while until I could make a few mistakes and get a feel for what it meant to sail alone. And feel it I did. It is both a blessing and curse to be a sensualist; that is to say, to need to feel and experience everything before I believe it. This aspect of my being has led to a great number of the little wrinkles I see in my face today. But it has also led to a person who shocked an old high school friend last night by not being the most cynical person at the table. Oddly, for me anyway, tribulation led to hope and a general positive outlook that life can be handled. And there’s always help there for the asking. I say all that to say this: I saw the newest CofN movie last night. It was my favorite of the books because there wasn’t one heroic character from any book I read or film I saw that I did not fall hopelessly in love with. It never mattered what they looked like — it was the heroism I loved. And Prince Caspian, purrr… And the movie was so, so good. I love the symbol of Christ as the Lion. It’s my favorite of all the manifestations of God on Earth. Lewis tapped that in me young, even if I wasn’t aware of it yet. I wept — hard — when the closing song started at the end of the movie. I offer it to you now. The words hit me on so many different levels at this time in my life. I just swim in this song. Bob, this is Regina Spektor. Merry Christmas all. I love you. Regrettably, I inadvertently hit the manual focus button on my camera lens so all my photos of rocking it out with the hometown girls in East Atlanta last night (we are the kind of crazy people who go drinking on a Tuesday. So you know.) are severely out of focus. I post them anyway because at least one of them is still kind of cool looking. The problem has been corrected (thank you Landers) so clear photos should be on the horizon. I apologize for the blurry. But then, that kind of was my perspective last night (martinis. ahem.) so they may actually be more appropriate than some polished version of the evening. Cause there really was nothing polished about kickin’ it old school at the former Ayn Rand bar. Good times. I got a new phone so pardon the cruddy quality of the picture while I figure out how to make pretty pictures with it. I want to introduce you to Elvis Candy Present. Back in the mid 90s, one of my best high school friends (some of you may know her as Annette) and I decided that we would no longer exchange Christmas gifts because it was a hassle trying to figure out what to get and Annette always felt bad for regifting me. So, in order to assuage her guilt and give me a smidge more time wherein I could refrain from making any kind of decision, we purchased Elvis Candy Present. 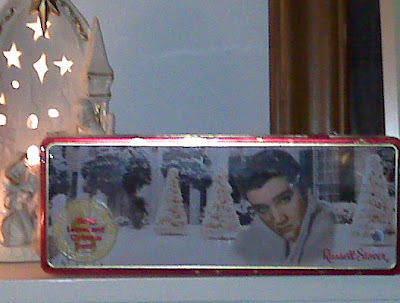 Elvis Candy is a tin of Russell Stover Chocolates — still in the original shrink-wrap — that Annette and I exchange at Christmas time. When she has it, she wraps it and gives it to me. When I have it, I do the same. It doesn’t happen every year, just when we remember. I’ve had it for about three years now so I think it’s time to let it live with her for a little while again. This kind of gifting makes for awesome Christmas card notes. “So you won’t have a blue Christmas” or “A Happy Holidays (said in Elvis voice).” We made a pact that if we both make it to old age we’re opening that tin together. By that point the chocolates will be dust I’m sure — I think the sell-by date is around 1996 — but we’ll laugh about how that tin of dust kept us friends all these years. Annette, Elvis is in the mail. And I totally and completely agree with this post. I’ve never seen the two minutes following Clark shooting down the snow hill with a trail of fire coming from his saucer sled because I laugh so hard I can’t see through my tears or hear over my howling. I think he ends up in a Wal-Mart. Anyway, yesterday, when I got to work, someone left a huge mason jar of Chex Mix on my desk, all gussied up in a Christmas ribbon. I’m having trouble decoding the meaning of this coincidence. Any ideas? And here’s a pretty damn amazing a capella version of my favorite Christmas song because ’tis the season. Have some eggnog this weekend. I love when things like this happen. Some people don’t care about coincidence — or they take note but focus on the randomness factor. I however, view coincidence as nothing less than synchronicity — which I think differs in connotation if nothing else — and I tend to pay close attention and am always comforted by what I perceive as proof that I’m on the right track. So thank you Jonah Goldberg, for reminding me of a few basic truths while I fight the urge to panic. Goldberg worked for the American Enterprise Institute and I’ve had their position openings page pulled up on my desktop for about two weeks now, having recently made the decision to really give a good run at think tanks. Obviously, none of these things constitute any kind of done deal. Just maybe the beginnings of a direction, a path. And, as if to put an exclamation point on the end of the phrase “Don’t Panic,” a good friend randomly (…) called yesterday and is helping me refinance my mortgage which could lower my monthly payment and potentially sever my ties with CitiMortgage, something that is tantamount to turning one’s back on the devil.